Rogers has been signed by Buffalo, Chris Brown of the Bills' official site reports. 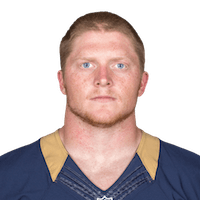 Analysis: The 2017 sixth-round pick of the Rams, who spent the season on the team's practice squad, has little chance of making Buffalo's final squad unless starting fullback Patrick DiMarco were to get injured. Rogers was waived by the Rams on Tuesday, Alden Gonzalez of ESPN.com reports. Analysis: Rogers was waived by the Rams just before the start of the season and ultimately ended up on the practice squad. Coach Sean McVay showed that he doesn't have much use for fullbacks in his offense, so his waiving isn't surprising this time around. There are no videos available for Sam Rogers. Click here to view all videos.